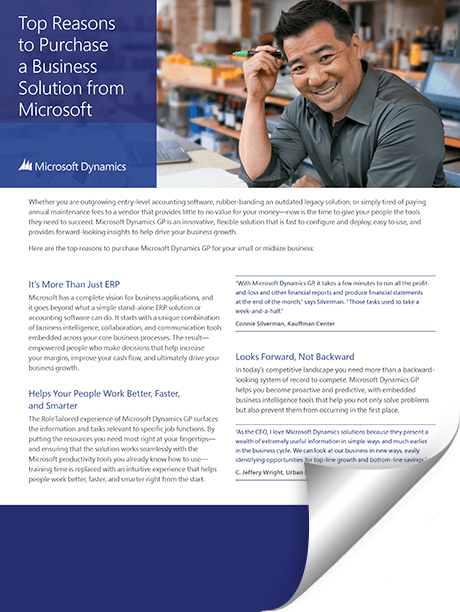 Microsoft Dynamics GP is more than just accounting software. It is a complete enterprise resource planning (ERP) solution that will help your business gain greater control over its financials, manage inventory and operations quicker and more accurately, and make informed decisions that will help drive continued growth and succes. In addition, your employees will benefit from a comprehensive set of tools that will help them boost productivity, increase sales, reduce expenses, and collaborate easier and more effectively than ever before – from anywhere and on any device. Thanks to its modular design, Microsoft Dynamics GP (formerly Great Plains) allows businesses to create a customized ERP solution that meets their specific needs. The functionality and product capabilities of Dynamics GP are outlined below. Easily and securely manage your cash, assets, and banking with Dynamics GP’s powerful suite of financial management and accounting tools. The Project Accounting module in Dynamics GP helps to ensure accurate accounting and billing processes throughout the project life-cycle. Reduce time-to-market and improve control of your entire supply chain with the Supply Chain Management module for Dynamics GP. Dynamics GP allows businesses to manage complex field service operations with higher levels of profitability and customer satisfaction. Dynamics GP helps you streamline your Human Resources and Payroll tasks with features such direct deposit, benefits tracking, and more! Find out why more than 45,000 businesses worldwide choose Dynamics GP for their accounting and business management needs.